When the SP250 was launched you could say that the steering, clutch and brake efforts all harmonised. Heavy perhaps, but harmonised. Whilst many owners consider the braking effort to be satisfactory without servo assistance, I have found there is a considerable demand for servo assistance. I mount the servo between the radiator and the grille, so that it is out of sight and does not obstruct what is a pretty full engine bay. 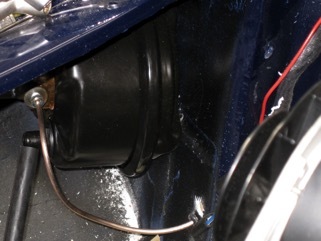 It is bolted to the right hand side of the radiator mounting bulkhead where it does not impede air flow through the radiator. The vacuum feed is taken off the rear of the inlet manifold using Daimler V8 Saloon components. This upgrade combines well with rack & pinion steering and the diaphragm clutch in order to harmonise control efforts at a lower level. It is also well suited for use with either 3 or 4 pot front calipers. 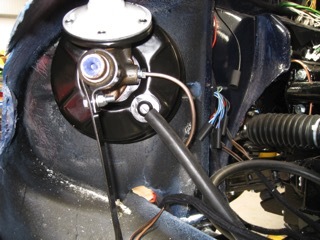 The left hand picture shows the servo viewed from the front of the car whereas the right hand picture is viewed from the side. Note the radiator has not been installed.